Looking really professional with a geared head. Putting a lot of faith in that slider. Ed began his career in theatre lighting in 1998 before a move into film lighting and the realisation you could get lamps more powerful than 2KW. 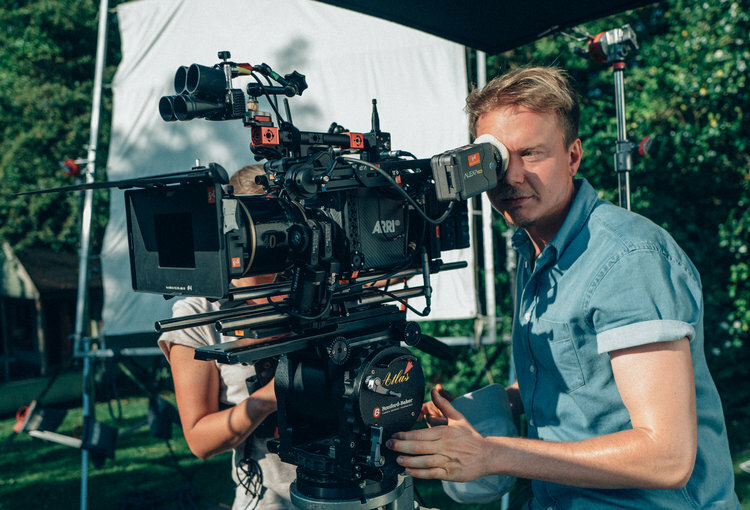 He's worked as a freelance cinematographer since 2009, mostly in narrative but with a healthy smattering of commercials. Despite living in Birmingham, one of the most land-locked cities in the UK, he's obsessed with diving and sailing. And helicopters. Who doesn't love helicopters? His credits include the sci-fi comedy Red Dwarf and the major primetime crime dramas Vera and Shetland. "110 Things I've Learned in Ten Years as a DP"
He's got a fluid head which isn't as good. But he's really filtered the photo hard, making up for it. Benedict has been working professionally for 15 years. He began as a lighting cameraman for Children's BBC and MTV. He has worked his way from factual-entertainment across promos and into commercials and scripted work. He lives in Hackney, London and has a set of Cooke 5i's which he keeps talking about. When he's stressed on set he chews chewing gum REALLY hard. Credits include promos for artists such as Leona Lewis and Beth Ditto, commercials for Sony Playstation, Carphone Warehouse and Asda, and scripted series such as Witless on BBC1 and GameFace for Channel 4/Hulu.